On the other hand, those with a reasonable solid present financial situation do not wish to pay the high interest rates of credit cards nor be restricted by the quick repayment requirements of payday loans. This is where a no-collateral, no-credit check personal loan will often be the most viable solution. Many online lenders offer personal loans with scheduled installment payments to those with bad credit. These loans can be taken out in higher amounts than payday loans (often up to $5,000 vs. $1,000). And because they can be repaid over a longer period of time, ranging from a few months to a few years, and be paid back piece by piece, they allow the borrower greater convenience for “medium-sized” loans. Since a lender of an unsecured personal loan relies primarily on your current income level and ability to repay, there is no need to demand collateral. Lenders may charge higher interest rates if your loan is relatively large or has a long repayment period, but they also often allow you to pay down your balance before or along with interest (unlike many credit card companies). An unsecured personal loan relies on your current employment status, income level, and other signs of ability to repay rather than your credit history to determine loan approval. Speed is of the utmost importance both to the borrowers of unsecured personal loans and to the lenders who compete to secure these borrowers. It is common knowledge that many who have been caught financially unprepared in the past, due to a recession, job loss, lay off, or other passing crisis, are in fact “good credit risks” even if their official credit scores don’t say so. There are many good reasons why lenders would be willing to provide bad credit loans. The same motivations can also lead some lenders to forego the credit check process altogether. One of the prime no-credit-check loan-types is an unsecured personal loan. Many people find themselves in the midst of personal financial crisis. You can hardly imagine the devastation caused by the mishandling of personal finances. 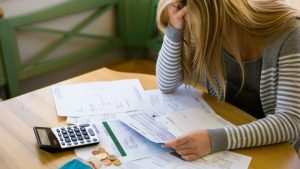 Aside from depression and low self-esteem, a personal financial crisis can include a variety of conditions that overlap and are rooted in financial mismanagement. The good news is that a personal financial crisis does not have to be the end of the world. You can recover from a personal financial crisis. You can get back on your feet. It will take time. It will take some planning. It can happen with the right dedication and devotion as well as patience. Unsecured personal loans are a means for people to get their financial lives in order. These loan instruments are not designed to serve as a long term strategy for personal financial stability. In essence, these types of loans act as a temporary form of relief or an economic stimulus that can boost financial recovery. Consumers should carefully consider the terms and conditions related to unsecured personal loans. Whether the borrower’s intention is to use the funds from such a loan to revamp personal finances or to handle a household matter like a home remodel or renovation, the borrower needs to keep in mind that these types of loans are intended to serve as an affordable option for getting money at highly competitive rates and based on income, not credit history. Bonsai Finance assists applicants who are potential borrowers identify the right fit in the form of a lender. The types of lenders that Bonsai Finance works with offer highly competitive rates with clearly defined terms along with a simple online application process. These types of no credit check loans are based on verifiable income rather than credit history. These online personal loans are meant to be both sensible and affordable. The process is meant to help potential borrowers find access to numerous loan options. There is no financial magic wand. There is no secret formula for personal finances. The best cure for a personal financial crisis is find a way-out debt and stay debt free. An unsecured personal loan is one means for getting on your way to a proactive plan for financial recovery. Are Loans with no credit check possible? Are Personal loans no credit check possible? Are Quick loans no credit check possible? Are Payday loans no credit check possible?